Jostein Gaarder’s surprise 1991 bestseller (it was translated from the Norwegian to English in 1995) skirts the very edges of Liquorature’s non-fiction rule by disguising a textbook intro to western philosophy as a story about a young girls education in the subject. This is offputting to some (“If I wanted a textbook,” complained one reader, “I would have taken the course at university.”) and not to everyone’s taste. Speaking for myself, I found it a light piece of work, tilted towards the layman who wants a reasonably non-technical review of the last two and half thousand years of western philosophical thought. Sophie is a young girl who starts receiving strange letters, asking strange questions, like “Why is Lego the greatest toy in the world?” and addressing her by name. Now given our paranoia about stalkers and media-hyped-up child molesters, you’d think the girl would be a little weirded out by this, but no, it’s all above board and through her and her strange pen-pal, we get all sorts of little bite sized packets of information regarding the emergence and development of western philosphy, from Heraclitus going forward. Gradually, as the lessons unfold, Sophie becomes aware of not only her teacher, Alberto Knox, but of a girl named Hilde, who shares her birthday, and whose father (like her own) is a peacekeeper with the UN. As the story proceeds, it begins to examine the connection between the reality of the physical world and that of the mind, and the story juxtaposes the reality of Sophie and Hilde and plays little games as to who is real and who is a figment of somebody else’s imagination (a similarity Stephen King had fun with in his “Dark Tower” series, done there much more entertainingly, it must be said). This takes us from Spinoza to Kant, Hume and then the modern philosophers (even Darwin). If I enjoyed anything about this discourse, it is the way Gaarder draws connections among the various philosophers and their ideas. He follows threads of thought through the ages: like Marx emerging from Hegel, or the modern Existentialists wrestling with thoughts expounded by the early Christian theologians (such as Aquinas); how Plato’s philosophy is still a bedrock (however shifting) upon which later thinkers built with ever more abstruse questions. At the end the nature of our assumptions are tested, reality is turned on its head, and you could argue that the denouement is really a distillation in fictional form of all that the book has been leading up to: up to and including the free will of the characters, the nature of the real (Holy Matrix, Batman! ), a neat little mystery rather too conveniently wrapped up and even a manifesto of sorts. Since I read a lot of non-fiction already, I don’t really need the sugar-coating Sophie’s World gives me, and the storyline pretty much left me cold – it’s just a writer’s tricks, I grumbled too often. However, the strength of the book is in the lectures, brief, on point, and far better written than the fictional side (and many a textbook, I should add). It was, and remains, marketed as a book for young adults, and this is probably correct, I judge. Adults either don’t want to be condescended to if they know this stuff, or talked down to if they do not (and if they do not by now, then they probably won’t want to). 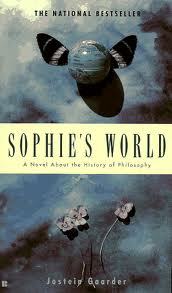 But for young people who want to learn more about the development of ideas and man’s thinking, they could do surely worse than spending a few hours a day reading Sophie’s World, and learning something about those who are at the very tips of the rabbit’s fur, looking at the universe and explaining to us what they see there. I had forgotten just how much more I enjoyed the idea of this book than the book itself. Great concept. Brilliant survey of philosophy. Teen fiction. Cut the fig leaf of fiction and you’re transgressing the no-fiction rule.